I don't know what am going to call this but take this as am posting it. I don't know if this is a promo or whatsoever, but take this info as e dey hot. Mtn is currently giving out overload data of 7GB for N2000. We fully know that Glo was leading and beating it competitors hands down by providing N2000 for 6GB and more other cheap data plans but this time around, Mtn is here leading in the data war amongst it competitors by providing 7GB for N2000. We know MTN has a good network coverage in almost all locations compared to Glo. So this is an opportunity for you guys to take advantage of this while it's still blazing. 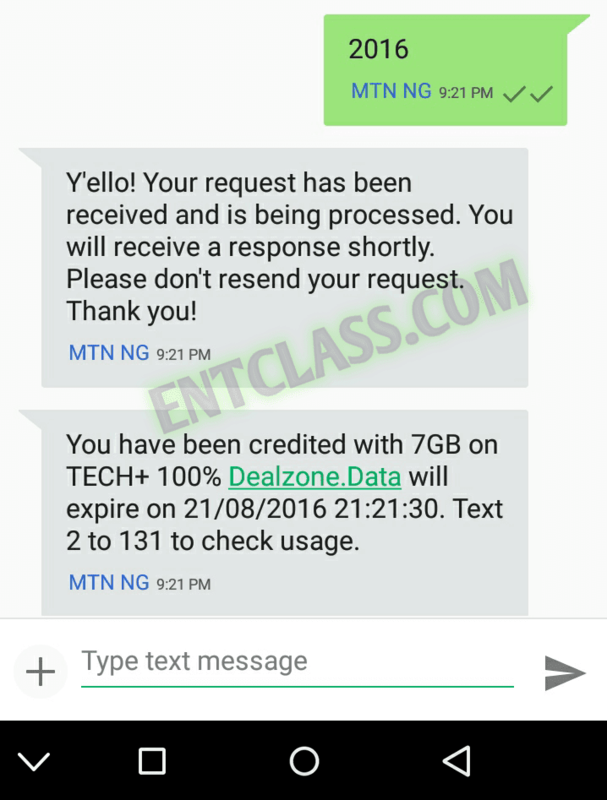 This is MTN Tech+ 100% Dealzone Data which gives you an overload data of 7GB for N2000. 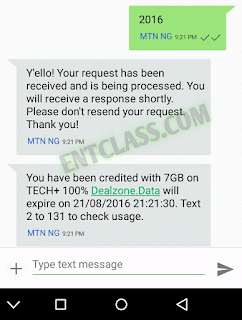 NOTE: I have personally tested and confirmed this data plan before publishing it here on Entclass.com. So, there's no cause for any ALARM!!!. Thats the most reason why people and fans depend on us for our updates. 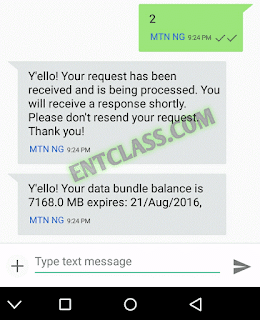 I will show you the step by steps guide i took before subscribing for this data plan. First of all, you need to confirm if your sim is eligible for the offer cos am sure many sims will be eligible but make sure you follow my steps carefully. Don't load any recharge card yet. If you receive a reply saying "you don't have insufficient balance..." Yupee!!! Your Sim is eligible. 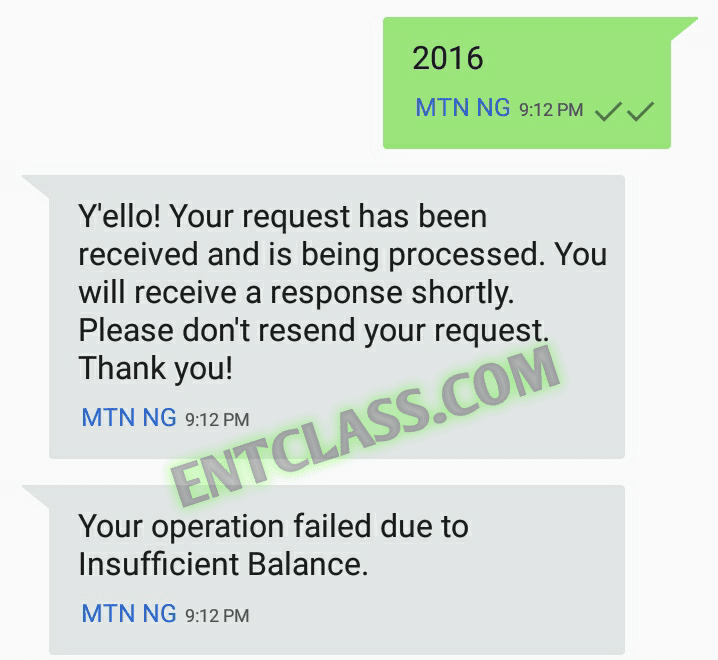 Now you can go ahead and recharge N2000 on your MTN line. Checkout my below screenshots and see how mine went. But if you receive any reply apart from Insufficient balance, am sorry, you are not eligible. Save your money. WHAT IS THE VALIDITY OF THIS DATA? As i am seeing things now, some do get 1 month validity, some people got 2 months validity while some even got 6 months validity. Any which way, don't forget to comment your validity period. As for me, i was given 1 month validity period. This data is an official data, it's not a tweak and it doesn't need any VPN apps like psiphon, zyphon, syphon, netify, tweakware, netloop etc to power your apps. It works directly. HOW CAN I CHECK DATA BALANCE? You can check your data balance via sms by sending 2 to 131. Checkout my screenshot below. WHAT DEVICES ARE SUPPORTED FOR THIS DATA? Android + any internet enabled devices. And you can also use the data on your PC via universal modern or via Hotspot tethering. If you have any problem or confused about this post, kindly comment below. 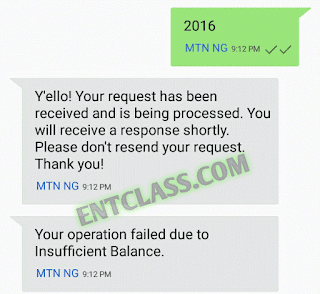 If you find it difficult to comment, kindly search Entclass on Google Playstore and install it. Or download it HERE and use it to comment easily and also get notified of new posts published here. Hey man kachi. I've got some of technology data let and I can't browse. I keep getting data reset what do I do? Has mtn Blocked it? Yes, it's a promo offer. Not available now.